A deliciously simple and traditional cornbread dressing filled with flavor! Perfect for Thanksgiving dinner, PLUS you can make the actual cornbread that goes in the stuffing ahead of time! Okay who’s excited for Thanksgiving?! I’ll put both hands up. I mean I am a food blogger after-all. I think it would be some kind of cardinal sin for a food blogger to not be crazy about a day centered around EATING. Before you judge me; I’m just kidding. I know Thanksgiving is a lot more than just eating which is really why I love it so much. Being with family and celebrating all that we have – it’s a pretty awesome day. And as a super family-obsessed gal, it’s definitely a top ranking holiday in my book. This cornbread dressing is to prepare you for the big Thanksgiving feast. And these Brussels with bacon and almonds would go perfectly as a side dish for said feast; we’ve already got both on the menu plans! Ever since I was a little girl, cornbread has always been my favorite. My dad would make us cornbread in his dutch ovens every single Saturday night. We all went crazy over that cornbread! So naturally I’m obsessed with a dressing made out of cornbread. And here’s the great news – the cornbread all comes from a delicious package. All you do is mix in an egg, some butter, and some milk. With everything else going on in the kitchen, it’s nice to have a little bit of a shortcut here! Speaking of which, this is one of those things you can make the day before! I always make a list : what I can make in advance, and what needs to be made the actual day. So it’s pretty perfect that the cornbread can be done a day before. You can cut it into cubes and put it on a tray and then just wrap that up and wait ’til the next day to finish it. The finishing touches are super easy, too. 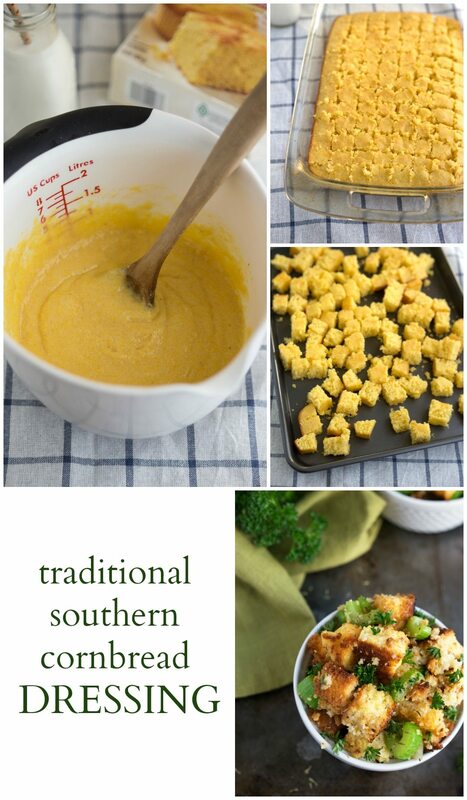 When you are ready to finish this dressing, the tray of cornbread gets and baked to create cornbread croutons. And while those are getting baked and delicious, the chopped celery and yellow onion get mixed with some olive oil in a skillet on the stovetop. 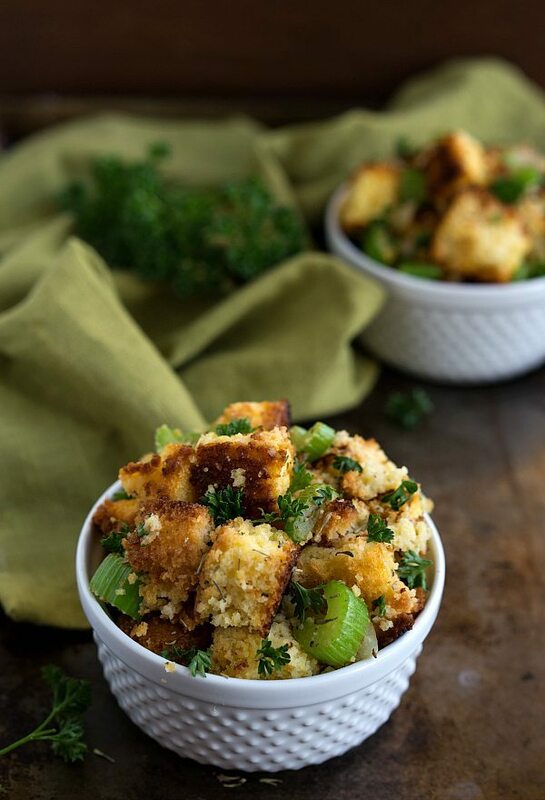 Once the vegetables are tender, they get stirred in with the baked cornbread croutons. Add in some chicken broth + the seasonings, and the dressing is nearly finished. Everything that has been all mixed together gets placed into a casserole dish and into the oven it goes. About 30-35 minutes later and the best ever cornbread dressing is ready for your turkey! Preheat the oven to 375 degrees F. Grease a 9 x 13 pan and set aside. Prepare the cornbread mix according to package directions. 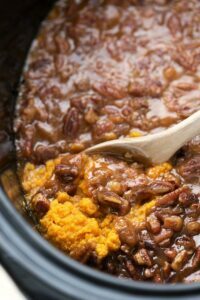 Pour the mixture into the prepared pan and bake for 18-22 minutes or until it is lightly golden brown. 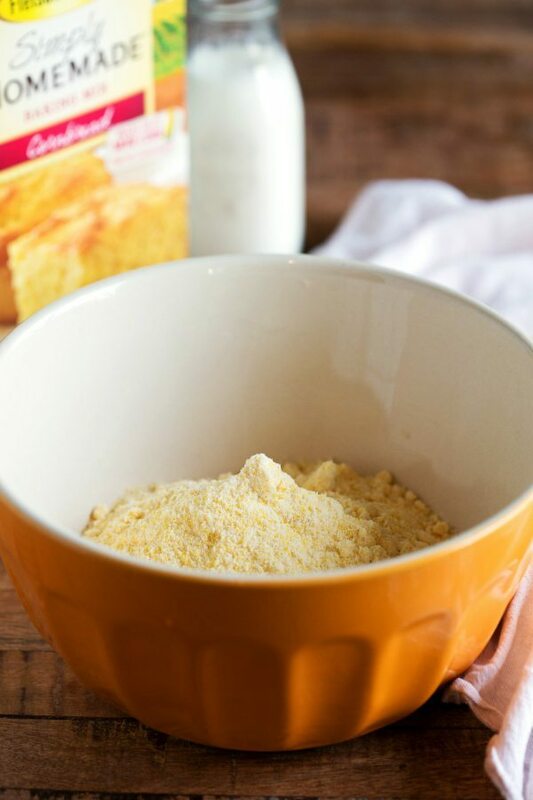 Cut the cornbread into one-inch cubes and spread evenly on an ungreased baking sheet. Bake at 350 degrees F for 15 minutes and allow to completely cool. Pour the olive oil in large skillet over medium heat. Add the chopped onions and celery and cook for 5-8 minutes or until tender. 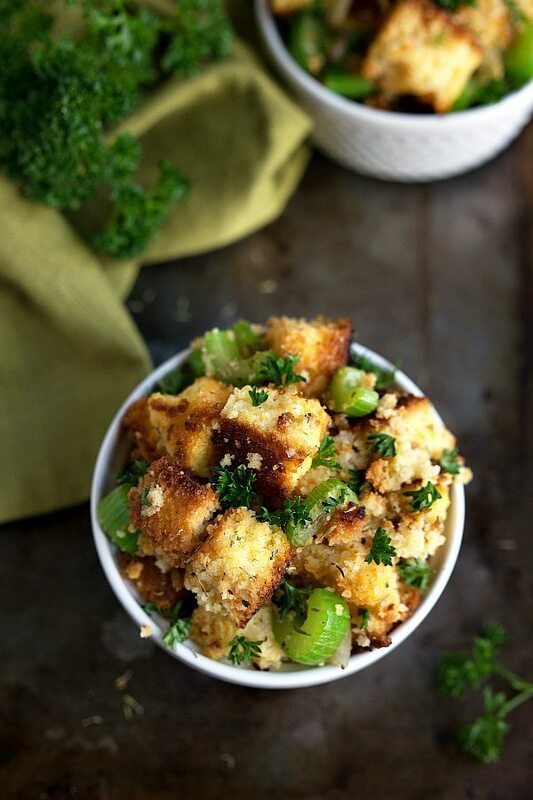 Combine the cooked cornbread croutons, onion and celery mixture, parsley, sage, salt and pepper in a large bowl. Stir in chicken broth and mix well. Pour into prepared pan. Bake uncovered 30 to 35 minutes, or until slightly golden brown. The cornbread can be made the night before. 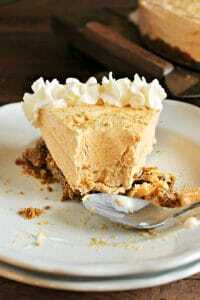 Frozen Pumpkin Pie Cheesecake – a delicious make ahead Thanksgiving dessert! 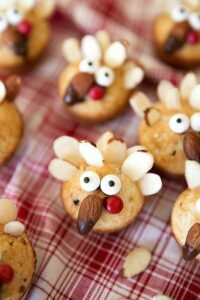 Cute and healthy Thanksgiving treat – a snack-sized mini muffin decorated like a turkey! I discovered cornbread when I first moved to the states…and it has become a love affair since then. IT IS SO GOOD. But used in a dressing? That right there is pure genius! Pinned! There’s no cornbread in Canada? What?? Cornbread has always been a favorite of mine, too! It reminds me of staying overnight at my grandparents house. My Grandma would make a skillet of cornbread to go along with breakfast every once in a while. I’m loving this cornbread stuffing, Chelsea! What a great idea to use cornbread instead of regular bread. Pinned! I can never get enough cornbread either! So tasty and I have been craving to make it into dressing. Love it! Ummmm you hit the nail on the head with this recipe! I love cornbread so much and you are a genius for using it this way! Pinned! I am drooling over here because I cannot wait for Thanksgiving to get here! This looks so delicious, Chelsea! Pinned! I’m super pumped for Thanksgiving! I’m weird and have never really been into dressing at Thanksgiving, but this is made of cornbread and I can’t say no to that. 🙂 Looks great, Chelsea! Pinned! Chelsea, this looks incredible! I LOVE cornbread! I always get so sad around Thanksgiving that we don’t celebrate it here in Europe – it seems like such a nice family holiday! Cornbread is the ONLY way to go when it comes to dressing!! It is just so much better! I LOVE cornbread, although when I was a kid we never had cornbread stuffing, just my Grandma’s traditional dressing, these days, I make sure we have both options. Your version looks heavenly! i’ve never had cornbread dressing but i’d love to try it. this sounds great! I’ve had cornbread before, but not quite like this! What a genius idea to make it as a dressing! Yay, so excited to see all your Thanksgiving recipes! 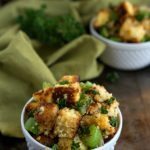 The stuffing and sides are always my favorite during the holidays 🙂 Love the cornbread in here – this looks so amazing! Chelsea, ok this traditional-southern-cornbread-dressing looks amazing!!! I too am SO excited for Thanksgiving! I’m hosting this year so need to complete my menu planning. . adding this to the list!!! Wow! love! This looks fantastic! Would you believe that I’ve never made (or even tried) cornbread in stuffing?? This seems like a major oversight on my part…looking forward to trying this! Your dressing looks so delicious! Definitely going to try it soon! That looks so delicious- I just tasted cornbread for the first time (Hi from Toronto Canada!) and am obsessed. I need to make this standard in Australia! Love cornbread dressing! The seasonings go perfectly. 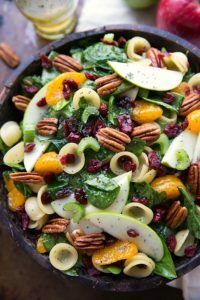 Great Thanksgiving side dish! Stuffing/dressing is by far one of my favorite parts of Thanksgiving. I mean, I guess you could just make/eat it any time of year, but it’s not the same. 😉 I love this classic cornbread dressing, Chelsea! Beautiful and savory and full of comforting goodness!